Alex Ayala, a second-year medical student, is also pursuing a master of public health at Feinberg. As a student in Feinberg’s MD/MPH Combined Degree Program, Alex Ayala is committed to improving health on both the individual and population level. 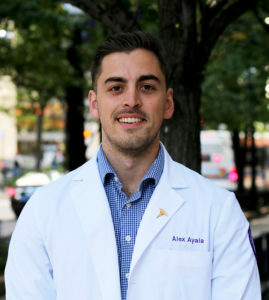 Beyond his studies in medicine and public health, however, Ayala is already actively involved in making a difference today: He serves as president of Chicago Medicine & Street Outreach, a student organization that provides basic care and social support to the city’s homeless population. This fall, Chicago Medicine & Street Outreach received the Student Senate Engagement Award, which recognizes the student organization that best represents leadership, student engagement and service. In this Q&A, Ayala shares what he loves about attending Feinberg, the impact of Chicago Medicine & Street Outreach, and how he maintains balance as a medical student. After growing up in California and attending Occidental College in Los Angeles, I wanted to explore other parts of the U.S. and the world. After graduating college, I moved to Madrid, Spain for a year to teach English on a Fulbright grant and I loved exploring different cities and cultures. So when I applied to medical schools, I knew I wanted to experience a new city and a new culture, which led me to Chicago. I also saw that Feinberg provided many opportunities to be involved in Chicago’s communities, such as the Devon Clinic and Education-Centered Medical Home (ECMH). Those programs, combined with the emphasis on self-care and wellness, convinced me that Feinberg would allow me to succeed as a medical student and give me the foundation to develop as a person and as a physician. Tell us about your involvement in Chicago Medicine Street Outreach. When I interviewed at Feinberg, I knew immediately I wanted to be involved with those experiencing unsheltered homelessness. I was shocked at the living conditions of many of Chicago’s citizens; many people live under freeways, in abandoned buildings, and use the CTA to sleep. Helping this population requires an understanding of not only medical treatments, but also of the social determinants of health that have brought them into this situation. Chicago Medicine & Street Outreach (CMSO), which launched at Feinberg three years ago, strives to serve those experiencing homelessness in the Chicago area. In conjunction with local non-profit organizations, we provide Feinberg students the opportunity to participate in weekly blood pressure screenings, monthly health education days and volunteer with the Night Ministry’s Street Medicine program. During my first year of medical school, my experience volunteering at various blood pressure screenings and outreach sessions solidified my interest in this work and I became president of the organization. The CMSO team hopes to continue helping Feinberg students learn how to provide optimal care to those experiencing unsheltered homelessness and increase our presence in Chicago’s communities. Going forward, we also plan to collaborate with other medical schools in the Chicago area to better serve those experiencing homelessness. How do you maintain balance with interests outside of medical school? Feinberg’s pass/fail curriculum allows students the time to really explore Chicago and have outside interests, especially during the first two years of medical school. So in the spirit of taking advantage of the low-stress environment, I am involved in many activities: I am a member of the Health Equity group on campus, I helped plan and coordinate Destination Chicago (a pre-orientation program for first-year medical students), I was a tutor for Chicago Youth Programs during my first year, and I help coordinate the intramural soccer league for Northwestern graduate students. Outside of Feinberg, I compete in powerlifting, which is the epitome of picking up something heavy and just putting it back down. I played soccer in college, and when I graduated I searched for a new athletic and competitive endeavor. Powerlifting provided a new challenge and I fell in love with it immediately. What has been your most rewarding experience at Feinberg? The most rewarding experiences so far have occurred during my ECMH clinic days. My clinic is at the Erie Family Health clinic in Humboldt Park, which provides primary care services for individuals who are low-income. While as first- or second-year medical students our medical knowledge is limited, we still have the ability to call patients, connect with them and help coordinate their care. For example, one patient I saw in clinic needed some outreach to make sure she was receiving the proper specialty care she required. One afternoon I called her to check in and at the end of the call she said, “Will you be at my next appointment at Erie?” It was clear that she trusted me and wanted me as an advocate for her. It was a great moment, because it felt like I was actually making an impact, even as a first-year medical student. Moments like this make me excited for my future in medicine.